Putting Visualisation Technique. See It - Feel It - Do It. A Simple One, Two, Three Go. Visualisation is a powerful technique used in sports training. This is because our brain responds better to a mental image than to words of instruction. The process takes the athlete to an image (or series of images) that conveys what perfection of a particular activity represents. On a personal level it is a way for you to pre-program your performance by using your imagination to create vivid pictures of a future desired outcome. Research has shown that your subconscious mind cannot tell the difference between an actual experience, and a vividly imagined one. If you imagine yourself doing something, your brain targets the same muscles used in that activity in response to your imagined movements. It is therefore possible to 'program in' a desired result. In short, mental training is effective because your mind controls your body and not the other way around. It can therefore be influenced by positive imagery. 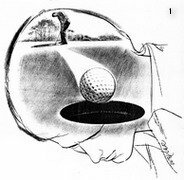 Putting Visualisation can work for you or against you depending on how you store your putting memories. Self-sabotage is a common problem as we trend to dwell on our failures rather than on our successes. 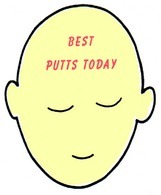 The first step in positive imagery is to stop harbouring your bad putts and focus only on your good putts. In other words you must immediately let go of failure, and through selective memory always picture yourself succeeding. At the end of the day when you are relaxing at home, close your eyes and go through the best shots from your round over and over in your mind's eye. See the putts you made and experience then again and again. Mark Wilson attributes his success in the 2007 Honda Classic to the help he received from sports pyschologist Dr Bob Rotella. Following the advice he received, he now makes a log after each round by typing into his computer all of his good shots, good putts, and good chips. He then reads through them over and over each night. Dr Karl Morris taught European Tour golfer Darren Clarke that how you use your memory affects your performance. In reviewing a good shot - as you play the action out in your mind's eye - you are rehearsing how to do it again. The more you think about the shot, the more vivid the picture you see, the more you are training your brain. The advantage of visualization as a training tool is that you can use it anywhere and at any time. You can use it off-course, during a practice session, or on-course between shots. An essential ingredient is being able to relax and free yourself from distractions so you can run the movies of past successes through your mind. 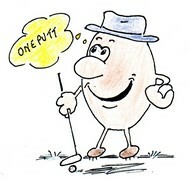 With practice we all can visualise and use the training technique of visualisation to better our putting performance.